The Memorandum of Understanding will bring cooperation on instrument and software development between what has long been the world’s leading neutron science facility, ILL, and ESS, the future global centre of research with neutrons. 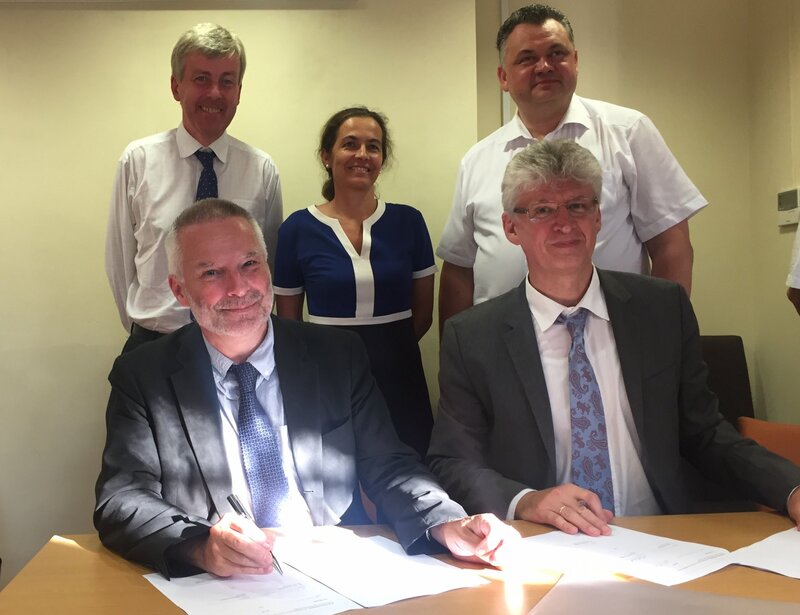 ABINGDON-ON-THAMES—The European Spallation Source (ESS) and the Institute Laue-Langevin (ILL) signed a Memorandum of Understanding (MoU) between the two research facilities yesterday at ILL’s Steering Committee meeting, held near Oxford in the UK. Both ESS Director General John Womersley and ESS Council Chair Lars Börjesson attended the meeting, reciprocating a similar visit by ILL Director Helmut Schober and Steering Committee Chair Grahame Blair to the ESS Council meeting earlier this month. “By cooperating for their mutual benefit and optimising the available resources, ESS and ILL will help maintain Europe’s leading position in neutron science and provide the user community with the state-of-the-art infrastructure they have every right to expect,” says Schober. Europe leads the world in neutron science. This is thanks to the excellent network of national and international facilities funded by many different European countries, combined with a broad-based and highly developed user community. The Institute Laue-Langevin was founded 50 years ago, and for many decades has been the world’s most productive source of research using neutrons. The European Spallation Source is under construction in Lund, Sweden, and is one-third complete. The facility’s unprecedented accelerator power and neutron brightness, combined with its unique capabilities and instrument designs, will make ESS the world’s leading neutron facility for decades to come. “Signing this memorandum commits ILL and ESS to work together in developing instrumentation and software for neutron scattering and to support and sustain the European scientific community using neutrons to advance fields from engineering to the life sciences,” says Womersley. The two facilities, which are both structured as consortiums including more than a dozen European nations, are fully committed to combining their forces in the interests of science, the neutron user community, and their stakeholders. They aim to reinforce Europe’s leading position in neutron research and technology by optimising the use of available resources. Yesterday’s signing formalises this joint endeavour on research and development activities. The MoU provides the framework required for enhanced cooperation between ESS and ILL, particularly in the fields of neutron-scattering instrumentation and beam components. It also addresses strategic issues such as the organisations’ relations with their stakeholders. Progress in neutron science depends on the continuous development of methods at the frontier of technical possibilities. The MoU will facilitate the exchange of experience and technical expertise accumulated at ESS and ILL in order to generate such new capabilities. The two organisations will be presenting their activities on a jointly-operated stand at the International Conference on Neutron Scattering (ICNS 2017) in Daejeon, Korea, in July.